ATLANTA — Navistar Inc. is expanding its line of remanufactured components for its trucks and its private-label, all-makes parts line as its parts business has experienced double-digit growth in the past five years, according to the company. Navistar is the parent company of the International Truck brand. ReNEWed, its remanufactured components business, and private label Fleetrite offer more than 100 product lines, said Josef Kory, senior vice president of parts. Much of that parts business growth “is due in large part to our commitment of providing customers the right products to support our dealers’ and customers’ needs,” Kory said. 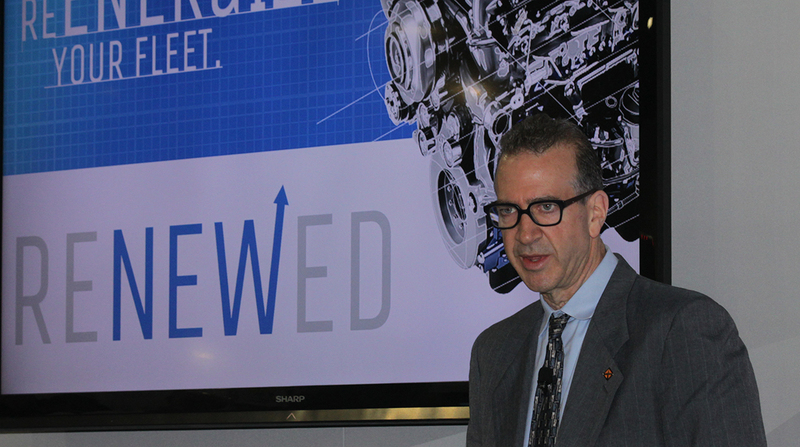 ReNEWed will offer several new product lines in 2018, starting with the 2015 N13 engine and the 2010-2016 I6 engine, as well as expand remanufactured electronic components such as engine control modules, instrument clusters and body controllers for operators of International trucks. ReNEWed products are many times re-engineered by the OEM, incorporating mid-cycle design modifications and enhancements that were previously introduced in the new product lineup. Also, Navistar created an updated brand mark for ReNEWed in hues of blue and gray. The design is symbolic of the integration of a re-engineered powertrain and a vehicle chassis, according to the company. The new brand mark will appear on components and marketing materials starting this spring. Turning to the all-makes parts business, Fleetrite has launched a comprehensive all-makes radiator and surge tank program. In addition to the All-Makes Collision Parts Program launched in early 2017, this provides product coverage for 24 makes and models covering 80% of the vehicles on the road. Fleetrite will expand its all-makes collision portfolio with bumpers, hoods, grilles and headlights as part of a commitment to help customers lower their operating expenses. Earlier this year, together with an International Truck dealer, Navistar launched its second Fleetrite-specific parts store in Clearwater, Fla., to better service existing customers and attract new customers. “To supplement our dealer locations, we want to continue to expand our regional and national footprint to ensure we are doing everything possible to meet our customers’ needs with increased availability and faster delivery of quality products,” Kory said. To support its parts business, International Truck has more than 700 dealer locations in North America. OnCommand Connection, its connected vehicle solution, features remote diagnostics platforms and over-the-air authorized engine calibration reflashing. “We actually use fault-code data from OnCommand Connection to forecast parts usage and ensure the right parts are in the right place when needed to ensure customer downtime is minimized,” Kory said.